The Poparazzi 3 person towable tube is on sale!! Most Orders Arrive in 1 - 2 Business days. Make sure you buy from a SportsStuff Authorized Dealer for a valid Warranty! Catch a wave with the new POPARAZZI for up to 3 riders! Its unique, high winged shape with rocker bottom allows you to carve into the wake and glide across the water’s surface with minimal drag. With a turn of the boat, inside riders will teeter deep into the wake while the other riders will rise high above it! Multiple EVA Foam body pads allow riders to comfortably perform every riding position imaginable. The unique High Rise Tower equipped with multiple Double Webbing Foam Handles with Knuckle Guards allow standing or kneeling on the back deck. Stand, sit, kneel, steer, lay, balance and freestyle with the new POPARAZZI! The paparazzi is one of the most fun towable tubes on the market. Have a blast with the sportsstuff paparazzi!! There are even videos on youtube.com that show experienced riders doing rollovers with the sportsstuff poparazi. 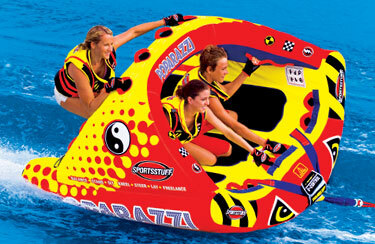 SportsStuff Poparazzi 3 Person Towable Tube 53-1750 Manufacturer Website. See the SportsStuff Poparazzi 3 Person Towable Tube 53-1750 in ACTION! SportsStuff Poparazzi Warranty Info Click Here Today! Returns-Refunds: If the box has been opened there are no refunds and this product can only be returned to the manufacturer for defects, warranty, and repairs.